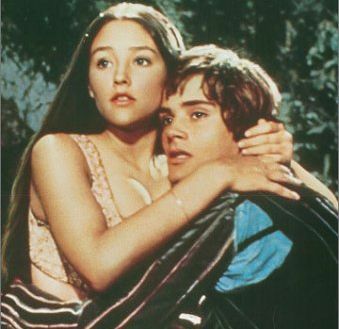 Franco Zeffirelli’s Romeo and Juliet is one of my favorite movies, so it’s fitting that I begin my blog here. I love the song from the Capulet feast, What is a Youth?. It’s so beautiful and haunting and captures for me the emotions of these young lovers. The song stays with me long after the movie is over. The film is lush and romantic, the scenery gorgeous, the costumes lovely, the actors young and full of angst and vitality. The film won Oscars for Best Cinematography and Costume Design. I’m not surprised. Olivia Hussey was so young (only 15!) and perfect as the innocent but headstrong Juliet. Leonard Whiting’s Romeo is my idea of a dreamy loverboy. I love watching these two together… so sweet, so romantic, so impetuous. Mercutio (played by John McEnery) is very funny with all his punning. You can see his temper rising with the temperature until he gets to the boiling point with Tybalt (played by Michael York). Tybalt is one of my least favorite characters in the film. I haven’t re-read the play yet, so I am eager to see how I feel about him when I do. In this film version, I find Tybalt whiny and uptight and annoying. He’s a tattletale at the Capulet feast and he’s a troublemaker when he’s out and about in Verona. The other characters I love in the film are the Nurse (Pat Heywood) and Friar Laurence (Milo O’Shea). They are both such over-the-top characters. The Nurse is so ribald and hilarious. You get a strong sense of the fondness between her and Juliet and the complete trust Juliet places in her. Friar Laurence is a good and trusted friend to Romeo. You can imagine his world falls apart when he sees the results of his efforts to help the lovers. So sad. 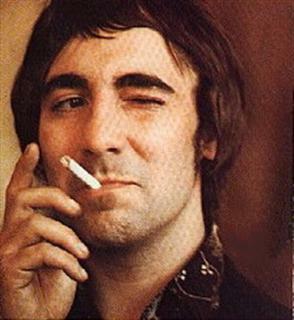 On a lighter note, Friar Laurence reminds me of Keith Moon from The Who. I thought of this throughout the movie. Do you see it? I would love to hear what others think of this film and if there are other film adaptations of Romeo and Juliet that I should put in my Netflix queue. West Side Story just came in the mail today, so I will blog about that soon.